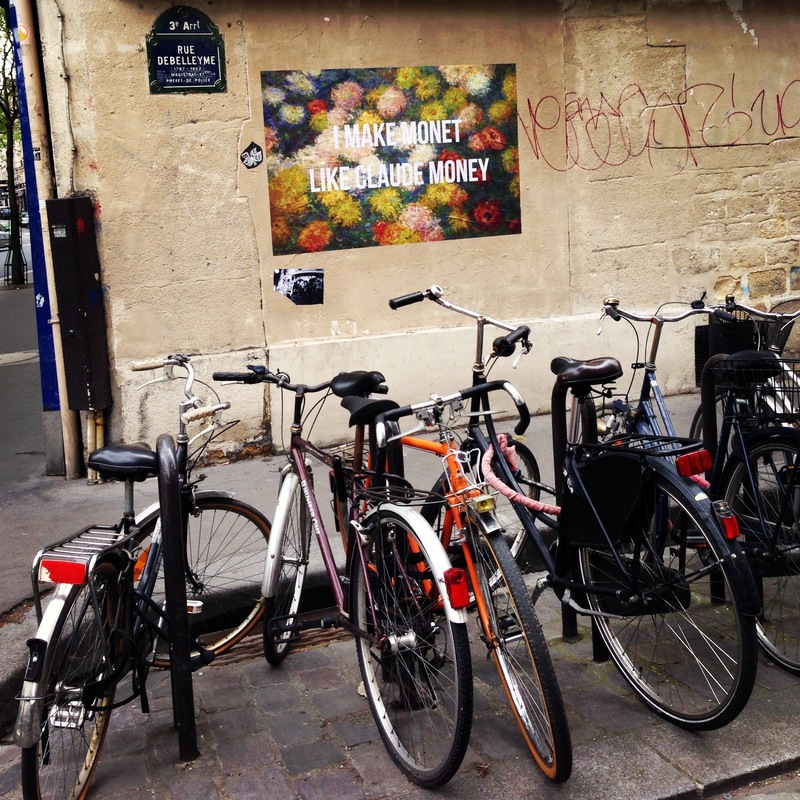 Street Art @ Le Marais | the (fake) parisienne. More and more I am realizing that the walls of Paris are a white canvas for artists and comedians. Every weekend I am more and more surprised by the frequency and quality of their art. Today was naturally no exception. We spent the late morning walking through the Marais before we settled on brunch at Cafe du Marche des Enfants Rouge. Along the way, just down the street from Rose Bakery (that was sadly too full to take us in), I saw this wall art that made me laugh. 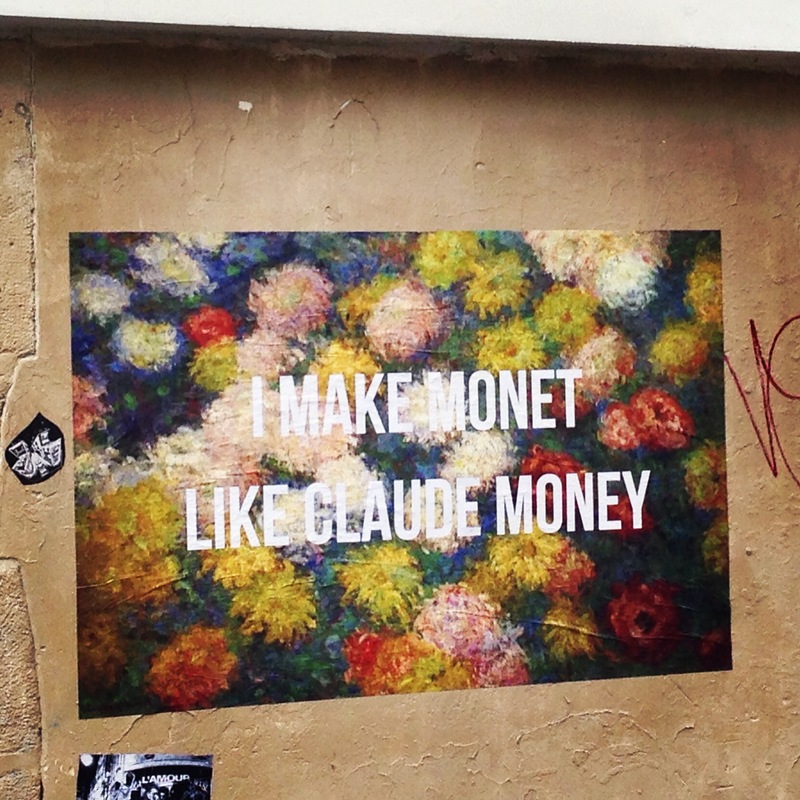 Of-course the French pronounce “money” as “monet” which adds to the sarcasm here. And what a beautiful background on which to superimpose this witty message. Ironically, we accidentally ended up at Musée de l’Orangerie in the Jardin des Tuileries just after brunch where we were really able to admire Claude Monet’s Les Nymphéas among lots of other art by Renoir, Degas, Cézanne, Modigliani, Soutine, Matisse and many others. It was the perfect easy Sunday. If only the temperature were kinder on us. Today we are back to single-digit temperatures after being in the 20C’s just last weekend. Why oh why dear Paris? Please, please, please bring Spring back!